USCF is the official sanctioning body for over the board tournament play in the US. With over 90,000 members, USCF offers something for every player, from beginner to Grandmaster! In addition to rating tournaments, the USCF supports and promotes chess activities throughout the US and publishes Chess Life, and Chess Life for Kids, two national magazines for members. ...and much more. "The will to win means nothing without the will to prepare!" This site can be overwhelming to beginners, but is one of the core chess sites on the Internet. Each week, as a service to their readers, they send out an e-mail newsletter, This Week at The Chess Cafe. Check it out if you are serious about your chess. The national organization of go players in the US. Go is an ancient Asian board game which combines simple rules with the basic elements of line and circle, black and white, wood and stone, to create a game even older than chess. Like chess, "go" (or "weiqui") has analogies with life which allow it to transcend being merely a game. A link page for all those looking for local Go action . 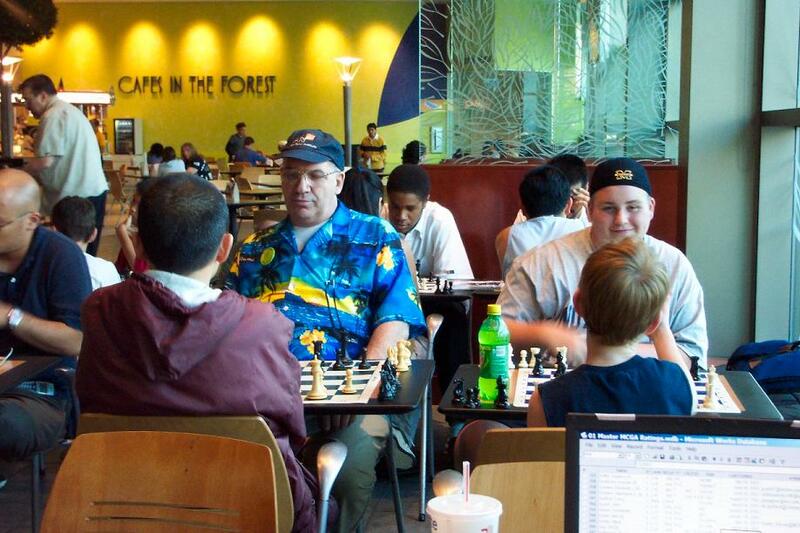 The Chess Club at Lakeforest Mall. This club is the only place in Montgomery County which is both centrally located and available at no charge to everyone seven-days-a-week. It is the largest free chess club in the state of Maryland. Lakeforest Mall (LFM) permits us to utilize space in their food court which is located on the lower level by the "blue snowflake" mall entrance (between Sears and Lord & Taylor). The chess club area is located next to the windows, adjacent to Central Newsstand. Several years ago, the mall management generously supplied us with twelve chess-tables. 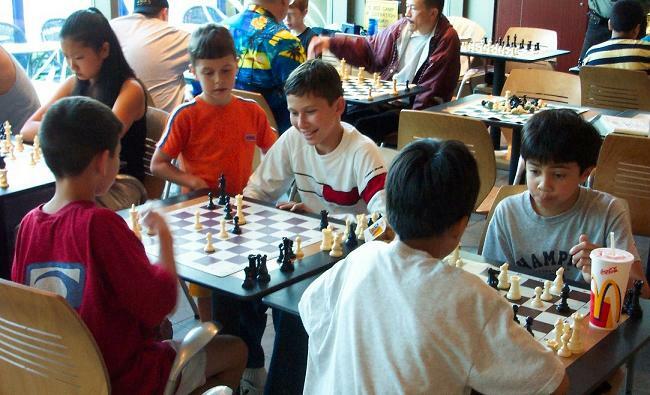 The club's activities are sponsored by the C&O Family Chess Center and players like you. Free Wi-Fi is available in the food court. It's not always fun losing to a girl! ...but it's fun watching! Currently, the official club hours are Monday through Friday, from 6:00 PM to 9:00 PM, and Saturday/Sunday from 12:00 noon to mall closing, but players are welcome any time during regular mall hours (the mall closes at 9:30 PM Monday through Saturday, and at 6:00 PM on Sunday). Players may not stay after mall hours. Most players bring their own sets and if you have your own equipment we recommend that you bring it. If you set up your equipment in our area at almost any time, it should not be long before an opponent arrives (or bring a friend). Feel free to read a book, have a snack or a drink, etc., but be patient. People do come and go all the time. As mentioned above, free Wi-Fi is available in the food court. 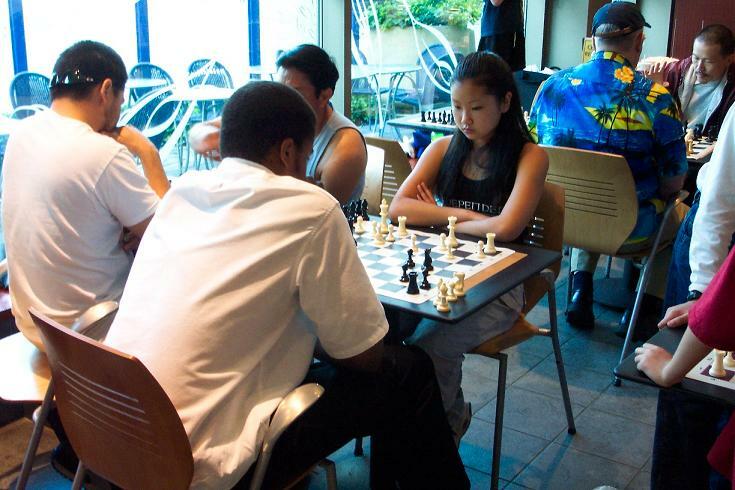 Players of all ages and levels are welcome and play is not limited to chess. Please understand and remember that we are primarily organized as a "family friendly" club, with children frequently in attendance. Please remember to dress and behave appropriately at all times. For those who are interested in supporting these activities, membership in the sponsoring parent organization is available. See Online-Center Membership. Volunteers are welcome at the mall. They may provide help, free lessons and some study materials to those who cannot afford them. Student and adult volunteers are welcome at the Saturday Morning Chess Club (SMCC), a C&O Family Chess Center paid club activity for beginners and intermediates (children and adults). MCPS students may receive credit for "volunteer SSL hours" at this activity. There is no charge to play during regular club hours, but donations to support the club are encouraged. Used chess equipment, clocks, chess magazines, books, or other donated materials are also welcomed and appreciated. Donations may be sent to the center or dropped of at the mall on Saturday mornings when coach Omar Pancoast is there. Volunteers who can attend on a regular basis and make an effort to welcome, or play with newcomers and children, are also appreciated. Ask how you can help or see the Membership page for more information. Saturday is a great day for chess kids! We are currently seeking volunteers who are willing to organize and direct club ladder or tournament competition. Coach Omar's schedule has forced him to cease these activities at the mall. Currently our club-rating system is based on the Chess.com Live Chess - "Rapid" (15|10 TC) rating and is roughly analogous to official USCF national ratings. It allows club and scholastic members to see how they compare with the rest of the country and the world. After about twenty "Rapid" games the rating becomes "established" and has been shown to have a high degree of correspondence to regular USCF ratings. We encourage all LFM Club players to join in this effort by registering for free on Chess.com. In the past, the C&O Family Chess Center sponsored both club-rated and USCF-rated (national) tournaments for those who want to experience this exciting aspect of chess. An inexpensive entry fee was charged for these events, and covers the cost of prizes, tournament administration, and rating charges. If you are a USCF certified Tournament Director, or are willing to become one, your help would be greatly appreciated to renew these activities. If you are interested in undertaking such challenges, Coach Omar will assist, and help train you. Contact him at the center (301-963-9122), on Chess.com (CoachOmar), or at OPancoast3@gmail.com. Regular players come from all over the world. Here anyone can relax and have fun. Free introductory inter-active on-line instruction is available to everyone through Chess.com, and the free downloads on our web-site. Inexpensive, "professional" chess lessons (for beginner and intermediate strength players) are available through Coach Omar Pancoast and the C&O Family Chess Center. See the Instruction page for details.